You know I’m always telling you guys stories, right? Well, this one (which I’ll tell you in a minute) came to mind after writing my last post, Breed Stereotyping – Why It’s Harmful, and Why We Need to Fight It. I started thinking more about how good dogs end up in animal shelters, or in situations that just aren’t working for them, and how there are so many dogs out there who need to be rescued. I’ve rescued on occasion, but I’m the first person to admit that I’m an unmitigated dog snob, with certain breed preferences. If my life at any particular time can accommodate a rescue, I’m fine with it. Sometimes, I even take dogs home knowing that I’ll be re-homing them because they need help, but I won’t keep them because they won’t fit in my household over the long term. Generally, I’m going to indulge my passion for purebred Boxers in the way that works best for me. It’s shocking how many dogs end up in animal shelters, though, or in situations that just aren’t working for them. The worst case scenario is that they end up being put to sleep. Fortunately, there are people out there who won’t let that happen. I know I’ve told you a lot about my friend Al, from the dog park, and his Saint Bernard, Hannah, who recently went to the Rainbow Bridge. I don’t think I’ve ever told you, though, that Hannah was a rescue. Al’s reaction was something along the lines of WTF? Is this person even real? So he started furiously typing, wanting to know why the person who posted the ad couldn’t have both a baby and a dog. And that’s how the love story between Al and Hannah began. I don’t know why that ad ended up at the top of the Google search, and neither does Al, but he says that he and Hannah were just meant to be. I think he might be right. Al was fortunate – other than the kid thing, Hannah didn’t have any issues – she was a wonderfully well-adjusted dog, and great with adults. And since Al wasn’t fond of children, there was no danger of Hannah coming into contact with them. Most of the time, our dog park was only occupied by adults, so anytime Al saw kids there, he’d just load Hannah back up in the van and go find another place to get her exercised. Sometimes, though, the situation is direr. A dog can end up needing to be rescued because it has serious issues, usually thanks to owners who didn’t provide leadership, didn’t have time to properly exercise the dog, or worse, decided to get rid of the dog because it didn’t fit their pre-conceived notion of how a dog should behave. Then, behavioral problems develop, people decide that they didn’t get the “right” dog, or that there is something “wrong” with the dog, and it ends up being dumped. That’s actually the best case scenario. Often, when a dog needs to be rescued, it’s because it’s been abused. The dogs owned by that horrible mediocre quarterback and dog fighter Michael Vick, the Vicktory Dogs, are examples of dogs that needed to be rescued from truly horrific conditions. And of course, animal shelters are full of dogs who are there for no other reason that they have been badly trained or misunderstood. Now, what all this means is that if you are considering rescuing a dog, you have to provide what he needed and lacked in his previous home, and you may very well have to deal with behavioral issues. That’s the bad news. The good news is that dogs pretty much live in the moment. They don’t dwell on what happened before, so you really can take an adult dog who has had problems, and work with him. If you do a good job, you’ll end up with a dog that can be a well-adjusted member of your household. You probably have some idea of what breed is going to tug at your heartstrings. For Al, it was Saint Bernards. So, take the approach to finding a rescue dog in much the same way as you would if you weren’t looking for a rescue – if you were just looking for a dog with no issues at all. Decide what breed pleases you, and then find one that needs your help. If your preference is for large dog, you shouldn’t be thinking of rescuing a toy poodle, a Shih Tzu, or another small breed. Conversely, if you want a little lap dog, don’t consider rescuing a Rottweiler or an English Mastiff. Believe me, there are dogs of all breeds out there who need rescuing, so go with the breed that pleases you. Think about the type of breed that is going to best suit your family, as well. If you’re kind of laid back, and your idea of a good time is lying around the family room binge-watching The Walking Dead, then you don’t want a high-energy breed. If you and your family are very athletic and love to go jogging or play outdoor games, then you definitely do want a high-energy dog. So, start looking around. Check out rescue sites online, and visit local animal shelters. Don’t bring home a dog that doesn’t fit with your family – if you do, you could end up harming the dog – a lazy breed (English Mastiff, for instance) is just going to end up stressed if you want to be out and about and active every minute of the day. By the same token, a high energy dog like a Labrador Retriever is going to be beyond frustrated if all you want to do is veg around the house. Remember, when you go to pick out a rescue dog that you are probably going to be dealing with an animal that is stressed. Don’t be surprised if the dog growls at you. He’s confused, and he doesn’t know why he’s been dumped. Let him get a good sniff at you, and look him in the eyes, but don’t maintain eye contact for too long – this could be perceived as aggression or dominance. In other words, greet the rescue dog the way other dogs greet dogs when they’re trying to avoid conflict. Stay calm, too. Of course you’re excited, because you might be bringing home a loving creature who will enrich your life for years to come, but give him his space. Also, try not to let the dog know that you feel sorry for him, even if you do – dogs perceive pity as weakness, and it frightens them. So, now that you’ve chosen your rescue dog, and any necessary paperwork is done up, it’s time to go home. Probably at this point you would love to get down to your dog’s level, and hug and kiss him, but please don’t do that. The dog may be very wary of having his space invaded, and he might see a hug as dominance, not affection. Also, don’t go straight home – take your dog for a walk so that he can expend some energy. 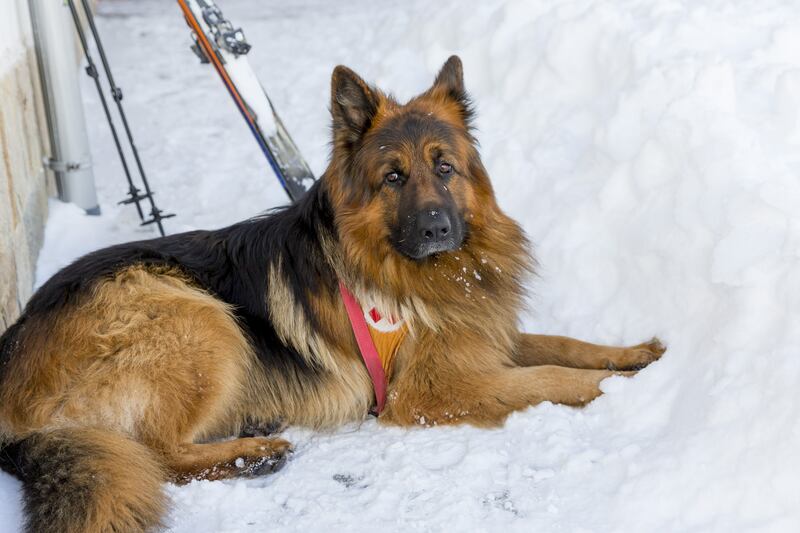 Walking him on leash will also establish your position as pack leader, and make your rescue dog feel safe, knowing that you are there to look after him. Make him heel on lead, and make sure that you walk in front. You’re letting him know that you’re in charge, and that you will take care of him. Once you get home, keep the dog on the lead. Why? Because if you let him off the lead, he’s going to run through every room in the house, trying to claim it as his. There’s a pretty good chance that the reason he’s up for rescue in the first place is because he was too dominant – so you want to how him that you are the leader. You go first. Then, when you’re finished establishing your ownership, he can investigate the house. Next, you need to show him where he is allowed to sleep and eat, and let him know if there are any areas that he can’t occupy. He’ll be fine with this, because there are very few true alphas (see Boot Camp for the Alpha Dog) – most dogs are quite happy to submit to your authority. But if you do have a dog who thinks he’s going to be the alpha, you’ll have to teach him new rules. You’re not being mean – you’re just giving him structure. This goes for guests, too. Don’t allow anyone in your home who is going to take the “I heard you got a new dog, can I give him kisses and treats and snuggles” approach. This can be a crate, or another room. Whichever you choose, let the dog smell his space before placing him in it. Put treats in the room or the crate, or on the dog bed you want him to occupy. If he seems calm, speak softly to him and guide him to his special place. If he’s not calm, take him for a walk and then make another attempt to introduce him to his space. Don’t get down on his level – if he’s nervous, you could be bitten. Once your rescue dog is calm, it’s okay to pet him. Don’t put your hand down on his head, though; it could be seen as a sign of aggression. Hold his head gently in your hands. He might try to curl up and turn away from you, and if he does, allow it. Don’t make direct eye contact. If he’s looking away from you and curling slightly, what he’s trying to tell you is that he’s accepting you as the alpha, but he’s still a bit nervous. If the dog shows dominance signs (ear perked up and puffing himself up to look bigger) stop petting him. He’s testing you, and telling you that he’s not sure he’s happy with you being the boss. Again, this is a point where you could be bitten. The more submissive (but not fearful) the dog is, the more you can pet him. Of course you will want to take your dog out to do his business. When you do this, make sure that the dog waits while you open the door. Then lead him out into the yard. If you think he’s likely to try to run, take him out on leash. This is important not just for the dog’s safety, but because a dog who is allowed to go wherever he chooses is displaying dominance behavior, and you want to be the boss. This, again, is “speaking dog,” and it can make all the difference when it comes to a good relationship, or a bad one, with your rescue dog. Often, dogs end up in shelters because humans don’t know how to deal with dominance issues, and they conclude that there is something “wrong” with the dog – there isn’t; there is something wrong with the owner. If you know how to “speak dog,” you can take a dog that someone else thought was unmanageable, and end up with what you might consider to be the best dog in the world. That’s what Al did. He took a dog that someone else thought was unmanageable under the circumstances that existed, and he made her his own. And she was, indisputably, his own. Hannah loved Al completely, and he loved her the same way. His heart broke when she died, but he’d never have traded the time he had with her for anything. Hannah could have been put down at a very young age if not for Al. I love it that they had such a long, wonderful time together, but of course I wish (as Al does) that it could have been for longer. Al tells me that he called Hannah’s “for then” mom when Hannah passed, and she told him that she was so grateful to have found Al, and so glad that Hannah enjoyed the long, happy life that she wouldn’t have been able to provide. Rescuing is about love. For Al, it was about love for a particular dog. For some rescuers, it’s about love for any dog who needs a home and a loving family. Sometimes, a rescue dog will give you the best love you’ll ever have in your life. Al says he knows that Hannah knew she was rescued, and she was grateful. Maybe he was just projecting his own feelings onto her – I don’t know. But what I do know is that there’s something wonderful in giving an unwanted dog a second chance. So why not rescue? You might end up with the best friend you’ve ever had. When you give love, you get love. And in the final analysis, that’s all that matters.